Information about qualifications, disqualifications, and open enrollment. Why you should join our department? The City of Albuquerque is located in the center of New Mexico. Between the foothills of the Rocky Mountains to the east, the Rio Grande river running through the heart of the city and the Petroglyph National Park to the west, Albuquerque offers a unique setting like no other city. The city is 182 square miles, and the elevation is 5,200 feet with an estimated 2017 population of 585,000. Albuquerque is the state’s largest city and has 310 days of sunshine, which make it possible to ski the slopes of the Sandia Mountains and play a round of golf, all in the same day. Major industries in the area include defense contracting, healthcare, software development, semiconductor manufacturing, telecommunications, data centers, religious and nonprofit organizations, the University of New Mexico and tourism. Recently, Netflix committed to making the city of Albuquerque as the site of their new U.S. production hub — which the company said will bring upwards of $1 billion in production money to New Mexico over the next decade and up to 1,000 production jobs per year. Albuquerque Fire Rescue was established on June 1, 1900, and has a Class 1 rating (the highest score possible) from the Insurance Service Office (ISO). Today, the department has 22 fire stations, 704 full-time firefighters and 27 civilian personnel. Fire stations are staffed with firefighters working a 48/96 shift with daily minimum staffing of 165. Over one-third of the departments, fire stations require Firefighters with specialized training. This includes our five Wildland Task Force stations, two Hazardous Materials Task Force stations, and one Technical Rescue Task Force station. Our frontline apparatus consisting of; 22 Fire Engines, 21 ALS Rescues, 1 BLS Rescue, 7 Ladders, 2 Hazardous Materials Squads, 1 HTR Squad, 4 Battalion Chiefs, 1 Paramedic QA, 5 Brush Trucks, 1 Air Truck, and 1 Rehab Unit. Each Engine is staffed with a minimum of four (Officer, Driver, and two Firefighters) and each ALS Rescue has minimum staffing of two (Paramedic Officer and Paramedic Driver). We also operate one ALS Engine with a Paramedic Driver, so that each district has an ALS response. Our department responded to just under 110,000 calls in 2018, making us the 30th busiest fire department in the country. We are also responsible for providing fire and EMS response to the Albuquerque International Balloon Fiesta. This is a world-renowned attraction and the largest ballooning event in the world; it is also one of the most photographed events in the world, as well as the largest annual international event held in the United States. While the majority of our Firefighters are assigned to frontline apparatus and respond to emergencies, we also have several Support Divisions that make up the rest of our department. There are 130 uniform firefighter positions and 27 civilian positions within these Support Divisions. These Divisions include our Fire Administration, Alarm Room, Fire Marshal’s Office (Fire Inspections and Plans Checking), Technical Services, Training Academy, Community Paramedicine, Pharmacy, Records Management, Fire Investigations, Emergency Management, Logistics, Fleet, Capital Improvements, and Special Operations all make up the Support Divisions. We have more resources than any other fire department in the state of New Mexico and offer a diverse career path for our firefighters. AFR is one of the only fire departments in the country with uniform Firefighters assigned to receive and dispatch 911 calls. There is a total of 27 Dispatchers assigned to our Alarm Room working on four separate shifts. The minimum staffing for each shift is 5 Dispatchers (at the rank of Driver) and one supervisor (rank of Lieutenant). Having our uniform dispatchers provides an advanced level of service to the community. 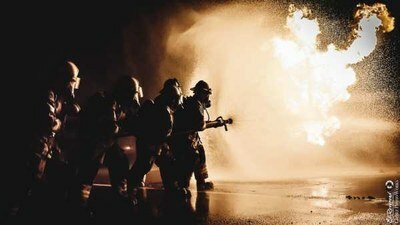 The person answering the 911 call and assisting the caller has real-world experience as a firefighter. These dispatchers also monitor each of our emergency scene incidents, including our structure fires, to ensure our firefighters are safe. The Fire Investigations Division is made up of eight firefighters and one civilian. Each Fire Investigator receives their law enforcement certification and additional training through the National Fire Academy. The Fire Investigations Division Captain, one Lieutenant and civilian administrative assistant work four 10-hour days. The other six Arson Investigators work a 48/96 shift, with one Lieutenant and one Driver on A, B, and C-Shift. The minimum staffing for the 48/96 shift is at least one Fire Investigator. We also have an accelerant detection canine assigned to one of our Fire Investigators. Our Fire Marshal’s Office (FMO) is responsible for the implementation, administration, and enforcement of the City of Albuquerque’s Fire Code (Ordinance 0-2017-020) – which incorporates the International Fire Code (2015 edition), and the NFPA 101 Life Safety Code (2015 edition), along with some local amendments. The Fire Marshal is appointed by the Fire Chief and manages a program that consists of twenty-seven uniformed firefighters and two civilian employees. The Plans Checking Division within FMO is responsible for document review, approval, and inspection of all commercial construction and building alterations. The division will also review plans and conduct inspections on all installed or modified fire protection systems. We have the largest FMO in the state and are working on expanding this division. H.E.A.R.T. (Home Engagement & Alternative Response Team) is the name of the AFR Community EMS Program. This program has two Paramedic Drivers, two Paramedic Lieutenants and one Paramedic Captain operating on a 40-hour work week. The goals of the HEART program are to identify repeat patients and connect them to appropriate medical and social services to help reduce the reliance on 911, fall prevention, and harm reduction related to opiate overdoses. With uniform positions in Records Management reviewing reports, nearly twenty uniform instructors teaching Fire and EMS courses, uniform Firefighters managing our technical services to uniform members operating our pharmacy, we offer more support positions than any other department in the state. As the first responder on all medical emergencies within the city, each of our firefighters is trained to a minimum level of EMT-Basic. AFR has partnered with the University of New Mexico to host a Paramedic Training School at our Fire Academy each year. We are one of three Fire Departments in the country that still has their own internal Paramedic School. This is a condensed Paramedic training program that allows us to complete the Paramedic training in 11-months rather than the standard two-year program, through a community college. We have a fair and objective testing process for those interested in this training. We have a high standard for our department and want to ensure that our firefighters are successful at each rank. Therefore, we offer advanced level training through the rank of Driver, Lieutenant, Captain, and Battalion Chief. Each AFR rank specific training course is paid for by the department. All of our Battalion Chiefs receive Blue Card ICS training too. Firefighters assigned to one of our Wildland, Technical Rescue or Hazardous Materials stations also receive advanced level training paid for by the department. Congratulations! You are taking the first step on your journey towards becoming a firefighter! Must be at least 18 years of age by the end of the Open Enrollment period. It is not mandatory to possess an EMT license to apply for employment with Albuquerque Fire Rescue. Applicants who do possess a current State or National Registry Emergency Medical Technician (EMT) license at the Basic level or higher may be given hiring preference. Candidates hired without an EMT license will attend an additional 6-week, expedited EMT-Basic course immediately following the 18-week cadet academy. Must possess a valid drivers license (out of state applicants must obtain a New Mexico driver's license within 30 days of being hired). Possession of, or have the ability to obtain a valid Class E New Mexico driver's license by graduation from the academy. two years of military service with proof of discharge disposition (DD214). Must be a United States Citizen or Legal Resident. Males under the age of 25 must be registered for Selective Service. If you satisfy all of the items above, you are ready to apply! Those who successfully pass the written entrance examination, Pack Test, and structured oral interview are eligible for selection by the Fire Chief. If selected, applicants must then pass a background investigation and medical exam. If applicants are not New Mexico licensed but are Nationally Registered EMTs and/or Paramedics and are selected as cadets, they will be required to complete the reciprocity process and acquire a State of New Mexico EMT license by graduation from the academy. To enroll in a EMT Basic Course applicants may contact any New Mexico College or University, such as Central New Mexico Community College or the University of New Mexico's EMS Academy at (505) 272-5757. When you are ready to apply, Open Enrollment is the first step in process. 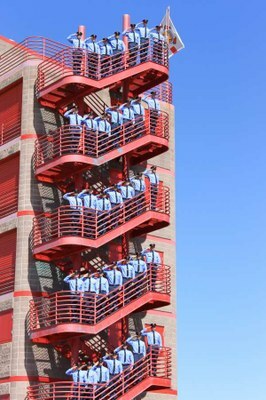 Individuals can submit an online application to begin the process to be considered as a candidate for the upcoming Albuquerque Fire Academy Cadet Class. Get Email Reminders About Open Enrollment! During the open enrollment period, you must apply online to become a firefighter via the button below. Applicants are required to submit an online application during open enrollment. Once you have submitted your application, it will be reviewed for completeness and verification of eligibility requirements. Applicants are required to have proper government issued identification and current EMS license on their person when checking in to all scheduled testing sessions. Applicants must be on time for each testing session. Applicants that are late or do not have the proper identification will not be admitted for testing. The written examination is designed to measure the skills and abilities needed to succeed as a firefighter. The written examination consists of 100 multiple choice questions. Skills and abilities measured include listening comprehension, mathematics, mechanical reasoning, language mechanics and reading comprehension. The Albuquerque Fire Rescue has adopted the Pack test as a physical ability component in the hiring process. Candidates must successfully complete the Pack Test at the arduous level. The Pack Test Sheet provides a detailed description of the test and training. Candidates will have the opportunity to demonstrate their personal qualifications, training, experience, attitude, and personal attributes. The structured oral interview panel consists of two Albuquerque Fire Rescue Company or Command Officers and one non-sworn City employee. Albuquerque Fire Rescue has an obligation to our community to maintain a highly effective and disciplined workforce that reflects the diverse character of our community. Our success is dependent on administering a hiring process that reflects high organizational standards, has a high level of professional integrity, and is absent of political influences. Personal Integrity - An applicant must not have committed any act(s) in their background that would indicate a lack of personal integrity or morality on the part of the applicant. Dishonesty - An applicant must not intentionally or unintentionally omit facts during any part of the background investigation. Drivers License - Applicants must possess a valid drivers license and out-of-state applicants must obtain a New Mexico drivers license within 30 days of being hired. Driving History - An applicant must not have a noticeable pattern of traffic arrests, citations and/or convictions within the last 3 years. Stop sign violations, red light violations, reckless driving, speeding, parking tickets and careless driving are just a few examples of traffic violations that could disqualify an applicant if he/she has developed a pattern. Employment History - An applicant must not have a history of unsatisfactory employment. Financial History - An applicant must not have a history or chronic recurring financial problems indicating an unwillingness or inability to live within his/her financial means. An applicant who has filed for bankruptcy will not necessarily disqualify an applicant. An applicant cannot be in collections for $500 or more. Military Service - An applicant must have had an Honorable Discharge, General Discharge under Honorable Conditions, as stipulated in the DD-214. All other Discharge dispositions, with the exception of a Dishonorable Discharge, will be considered on a case-by-case basis. Criminal History - An applicant must not have been convicted of any misdemeanor violation within the last 3 years. A misdemeanor violation that an applicant did commit in his/her past, but not within the past 3 years, will be looked at on a case-by-case basis. A felony conviction will automatically disqualify an applicant. An applicant cannot have been convicted of Domestic Violence. Driving While Intoxicated - An applicant will be disqualified if he/she has had a conviction or any admittance of guilt for driving under the influence of alcohol within the last 5 years or have committed multiple DWIs within the last 10 years whether from an administrative sanction by the Motor Vehicle Department, a criminal conviction or any admittance of guilt or by military disciplinary action. Illegal Drug Usage - An applicant must not have used any illegal drug that would amount to a misdemeanor crime if found in possession within the last 3 years. *Exception: an applicant must not have used marijuana within the last two years. An applicant must not have used an illegal drug which would amount to a felony crime if found in possession within the last 5 years. An applicant that lives 100 miles or greater from the City of Albuquerque may participate in the Out of Town Applicant examination week. Applicants will be scheduled to take the Written Examination, Pack Test, and Structured Oral Interview. Each applicant must pass each element of the hiring process before proceeding to the next portion of the hiring process. Failure of any one element will result in removal from the hiring process. Out of Town applicants must provide a Certificate that indicates successful completion of the Candidate Physical Ability Test when reporting for the Written Examination. The CPAT must have been completed within one year of the date of the Written Examination. For more information on finding a CPAT test site outside of New Mexico, please visit the National Testing Network.